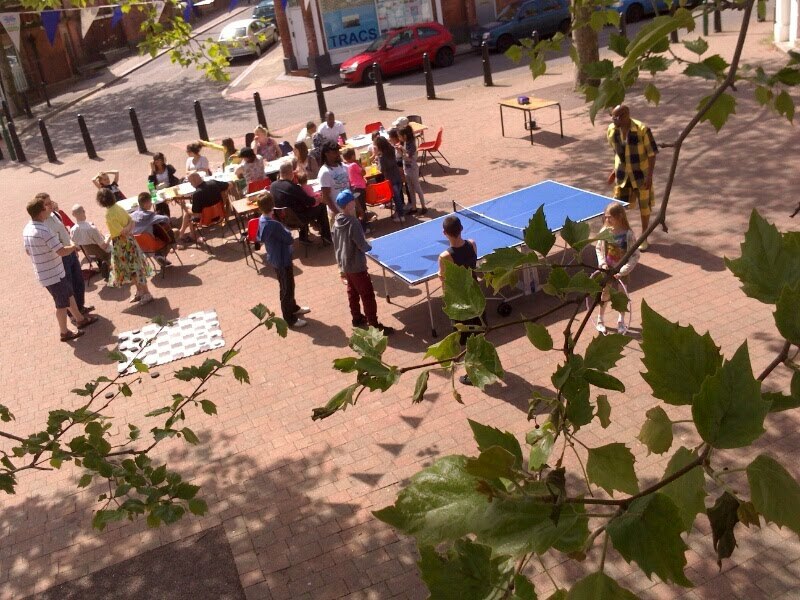 The Sneinton Hub team put on a social eating event in Hermitage Square this afternoon- on a lovely sunny day people gathered to eat, talk, play table tennis and listen to music. It was part of an annual national 'Big Lunch' programme, and the team plan to learn from this year's event to make this a regular Sneinton annual gathering. "Many of us in the UK lead lonely lives, and The Big Lunch can be a great excuse to get out and meet the people who we share a street, road, estate or block of flats with. "You might think a street party is the last thing you’d do to tackle crime, domestic violence, homelessness or children in poverty. But, it really can be the start of facing up to tough issues. Two million more single-person households by 2019. More rich, poor and ethnic ghettos than ever before. 7% annual drop in trust between neighbours from 2003-05. Social trust in the UK halved and now among the lowest in Europe."